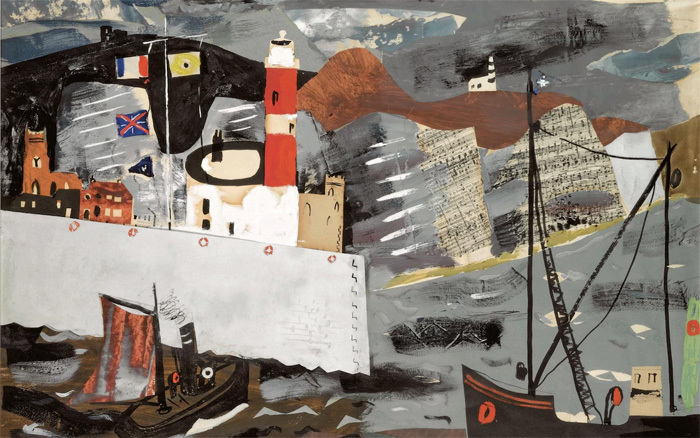 Sandra Gibson examines the combination of tradition and modernity in the work of British artist John Piper. Whatever direction you look … is worthy of contemporary painting. Pure abstraction is undernourished. It should at least be allowed to feed on a bare beach with tins and broken bottles. So there is acknowledgement and exploration but Piper found abstraction deficient as an end in itself. Throughout his life Piper was interested in the figurative depiction of the English countryside and coast, and in early English sculpture and architecture, especially churches, and it is this tension between tradition and modernity that characterises Piper’s career. On the one hand it led him into projects such as documenting English carved fonts for the British Museum, and found him “abiding in the romantic painting of this country” in the post-war years. On the other hand, he launched the arts publication Axis (1935-37) with his wife Myfanwy Evans. This was the first magazine in Britain to report on abstract art and all the great names and movements of the time were covered. He also transposed some of his abstract painting into stage sets, his first commission: abstract, futuristic and hard-edged, being for Stephen Spender’s Trial of a Judge (1938). Yet the two preoccupations were not mutually exclusive. We find that Piper’s penchant for abstraction can be traced to his interest in such artefacts as the time-corroded sculpted stone Life of Christ (late C8th – early C9th), exhibited at Tate Liverpool. Though the eyes still penetrate, the rest of the body details are almost obliterated, abstracted. Whilst his landscapes appear conventional and in the tradition of British art, we find techniques used by Cubists such as Braque and Picasso incorporated: the voluptuous guitar curve, the decorative parallel lines which evoke guitar strings, the inclusion of wallpaper, the use of paper doilies to create stencilled effects, areas of musical notation and even admission tickets. In Beach with Starfish (1933-34) the incorporation of mundane material becomes a bigger feature. Cliffs of newsprint give this coastal landscape a surrealist edge. Piper’s return to figurative work showed a looser, more spontaneous approach. His landscape collages of 1936-38, including Littlestone-on-Sea, and Angle Bay, were done on the spot, working in all weathers and conditions, tearing coloured papers in response to momentary colours and shapes. Capturing the moment in this way linked him with the Impressionists, whilst the use of torn paper is similar to the Cubists and pre-empts Matisse. one with overlapping shapes, the other more sparsely lyrical, with a yellow sphere. Incorporating the exterior and the interior, View from a Window is a mixed media piece on paper with gouache and fabric, enriched by silver leaf. The view of the sea, with a vase in the foreground, is a picture within the picture. To emphasise the theatrical nature of this painting, the scene is partially concealed, and surrounded by curtains created by using paper doilies for a stencilled effect. Further decorative impact comes from striped wall-paper, a mottled carpet and areas of silver leaf to create a special hyper-white. Because the window frame also looks like a picture frame, the artist plays a surrealist trick: is this really an exterior view of a ship on a grey sea or is it a painting? Is it also a comment on the rather blinkered, net-curtained way the British looked at the gathering clouds of war? When World War II came, the shortage of materials and of buyers led to an arrangement with the British Government, in which artists were paid to produce murals for propagandist purposes. Piper’s paintings of bombed-out and burning buildings are among his most dramatic works. Take Christ Church, Newgate Street (1941) for example: a painting which combines the theatrical with the monumental, and which gave Piper the opportunity to express his fervent interest in church architecture. The ecclesiastical shapes of what remains are set against a background of black, silvery white, midnight blue and dark grey. The night sky colours are abstracted into adjacent blocks of colour to give the impression of night and darkness being momentarily transformed by bright light, such as searchlights or explosions: stunning glimpses of things caught in unnatural light, and so theatrical. The remains of the interior are portrayed as monuments: statuesque, almost figurative, still standing though ravaged, and giving a sense of the eternal, like the intact ecclesiastical shapes. This must have served to lift the spirits of people threatened by a secular, remorseless ideology, whose engines of war tore apart the night sky. After the gothic intensity of burning and ruined monumental buildings against open skies, Piper’s interiors of the Bristol Southwest Regional Headquarters seem captured in omnipresent institutional lighting, the sort that would remain on, night and day, behind shuttered windows. Such were the secret places of war strategy, where directed light would focus on the areas of vital interest in the theatre of combat. These interiors are factual records of what such places were like: functional – the passage floor is marked like a road – almost clinical, and devoid of any comfort. Having no human content gives them an eerie dramatic tension, like the work of de Chirico, which is intensified by the contrasting gloom of the shadows – those areas where the lights are not focussed. The painting of the Control Room itself has elements of abstraction, everything being reduced to the simplicity of a map shape, with regional specificity of number and letter: highlighted ciphers under the single-pointed scrutiny of electricity. During and after the War, up to the early Fifties, there was a wider revival of interest in the English landscape and buildings and the art and ideas of the Romantic period, including the notion of the sublimity of Nature. One would expect this kind of nostalgic reinforcement in times of national danger. Piper’s work from this period includes Rocks on the Glyder Mountain (1951), a portrayal of the sublime using the imagery of geological power. Ecclesiastical water colours such as Christ in Majesty (1938), with its stained glass motif, and The Stoning of St. Stephen (1939), given a mediaeval feeling with its diamond shape and deep reds and blues, remind us of Piper’s interest in designing stained glass, which would lead to post-war projects in Coventry Cathedral (1955) as well as in Liverpool’s Metropolitan Cathedral, opened in 1967. Parallel with this adherence to the former tradition of English art, we have something like Abstract 56 – a mid-century textile design of all-over repeated abstract shapes, screen-printed on rayon. A lot has been made of John Egerton Christmas Piper’s position in the cannon of British art: embracing and combining elements of the old and new, the figurative and the abstract, using several genres, and raising awareness of the avant garde through his writing. He has been regarded as crucial to the assimilation of abstract techniques in the development of British art, even though he found abstraction lacking. Perhaps that’s why he would exhibit his more conventional landscapes alongside abstract pieces: to make the point, as this Tate exhibition does. However, although he had returned to figurative content, it was his abstract work that began to attract the interest of architects and interior designers. My view is that the strength of Piper as an artist is more strongly based on his compositional and narrative power than on his innovations, which appear somewhat dated in an era where anything goes in terms of subject matter, materials and techniques. That and his rich, sumptuous, colour palette, so redolent of sea and shore and land; so ready to use black and white; so fluent in suggesting detail with a minimal brush stroke. 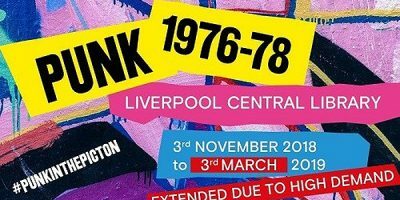 There is still time to see this collection of work and it is worth seeing.